Bloggers and youtubbers if you use any part of this method at least give CoilyQueens Rock credit. I hear lots of women with tightly coily hair express aggravation with achieving the twistout or braidout look they desire. 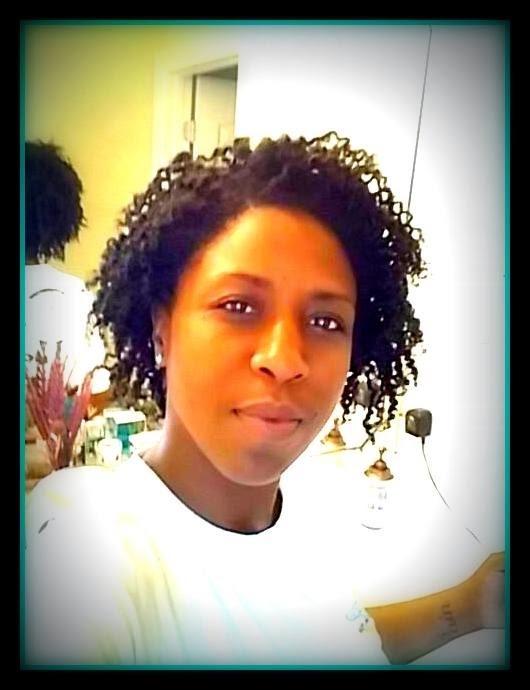 Some women with tightly coily or type 4c hair have issues with frizz, getting their hair to clump and their hair to stay defined while in the twistout style. Miss Vee's Crescendo Twistout method enables your tightly coily hair to achieve beautiful definition and long lasting coils. How? The crescendo twist method starts with small twists to build texture, then increases twist size each day to add volume. No gel needed only leave in conditioner and natural oils. Day one: Always start your twistouts on freshly washed and deep conditioned hair. Style your hair in small two strand twists, using a leave in conditioner and natural oils.If you desire a part go ahead and make your style part before you begin twisting. Depending on how long and thick your hair is you should create about 50 small twists all over your head. On this picture I did about 5 twists per row and I had 10 rows going horizontal. My hair is normal density and long. Allow style to set overnight. Day two (a.m.): Apply some natural oil to your hands separate each twist once. This is close to how your hair should look in the morning. After taking all your twists out, proceed to separate each section (yellow arrows above) one or two more times. How to separate: hold your hair on the end and see where the hair is separating on its own. Do not force it if your twists do not want to separate, this will create frizz. Shake your hair to fluff a little and go. Do not use a pick or comb. Day two (p,m. ): Bedtime hair prep. Apply a little leave in conditioner to each section but this time create medium twists. You should have 18-21 twists on your head when you finish. You will be able to see where your twist separate naturally. Notice the picture below this is one medium twist unraveled and gently pulled by the ends, notice the yellow arrow you can see where the hair separates. The small twists you created on day one give you the definition on day 3, this definition makes it easy to separate your twist into smaller sections without causing frizz, which is common with tightly coily 4C hair. 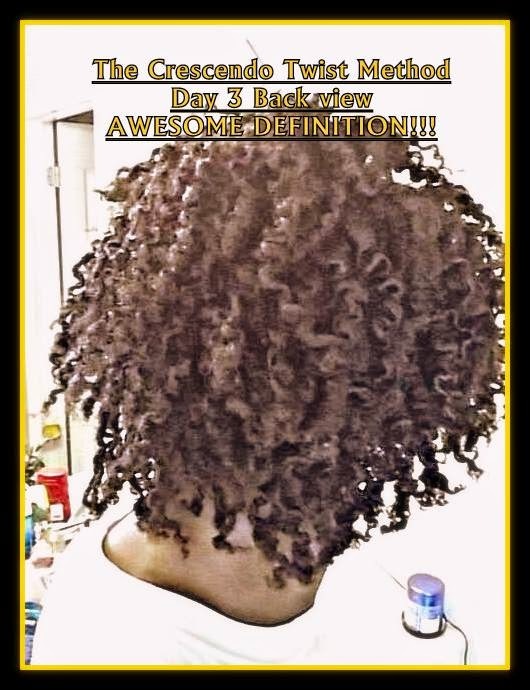 On day three you should have a full well defined twist out which will our last 1 to 2 weeks. Be sure to cover your hair at bedtime. For the duration of your style you only need to apply your leave in conditioner as needed. Apply natural oils daily. Bedtime prep for the duration of your twist out, you can put your hair in medium large twist for bedtime. Generally 10 to 15 twists to maintain this style. Notice my roots, I still have shape from the original small twist set on day one. From day three and beyond, I set my hair by doing 4 or 8 big twists, at bedtime. Each night your twist get bigger and bigger. The small twists you started with create texture and definition to help your twist out look more defined. Many tightly coily ladies find it difficult to get their hair to clump and define they way they desire. This method will take someone with 4c hair and temporary give them a curlier base to build on. How does it do that? The small twists created on day one give your hair definition and each day your twists get bigger and bigger. Each size twists build on the next twist. This cuts down on frizz because your hair separates into sections easier. With this style you need to oil your scalp and hair daily, this eliminate tangles and single strand knots and gives your hair sheen. Besides creating your starting part, no comb is needed to do these twists unless that is your preference. Using a good leave in conditioner is essential to creating a beautiful twist out. Day two soft hold twist out years ago. Once upon a time I dealt with lots of frizz! Day 5 twist out still holding on not to bad! Very important to accept your twist out for what your hair is currently capable of doing. Meaning do not judge your twist out by another person's twist out. To some my twist out may not look that defined or good. But I know hair and I know it looks good for what my hair can do. My hair is tightly coily and it never photographs as well as it looks in person. So do not judge a look by picture alone. During the last week of my twistout it gets bigger and bigger. Generally by this time my bedtime routine consist of about 8 twists. If I have a special occasion, I can always apply more leave in conditioner and natural oil and create smaller twists to give my twist out a fresh look. 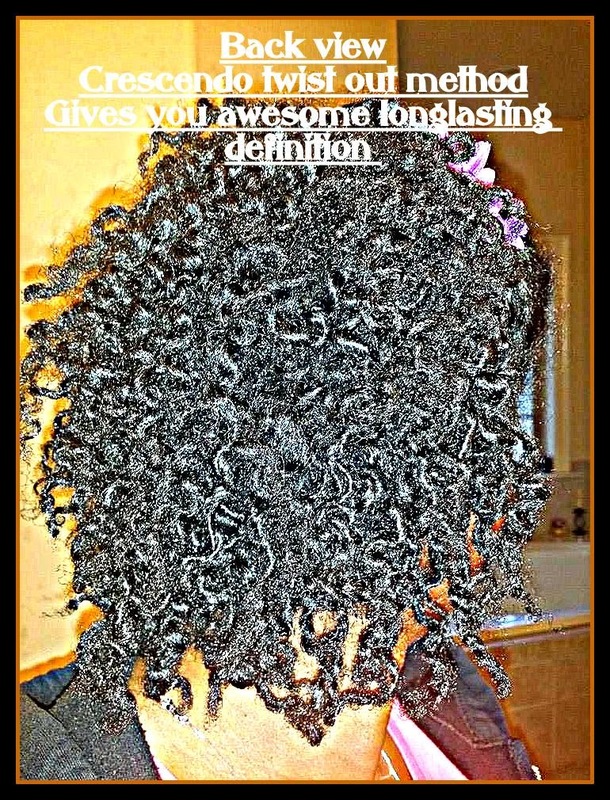 Using a good styling product is essential for creating a long lasting well defined twist out. For tightly coily hair I recommend the following products for twistouts: Cantu shea butter leave in conditioner, shea moisture enhancing smoothie or the As I Am double butter cream. 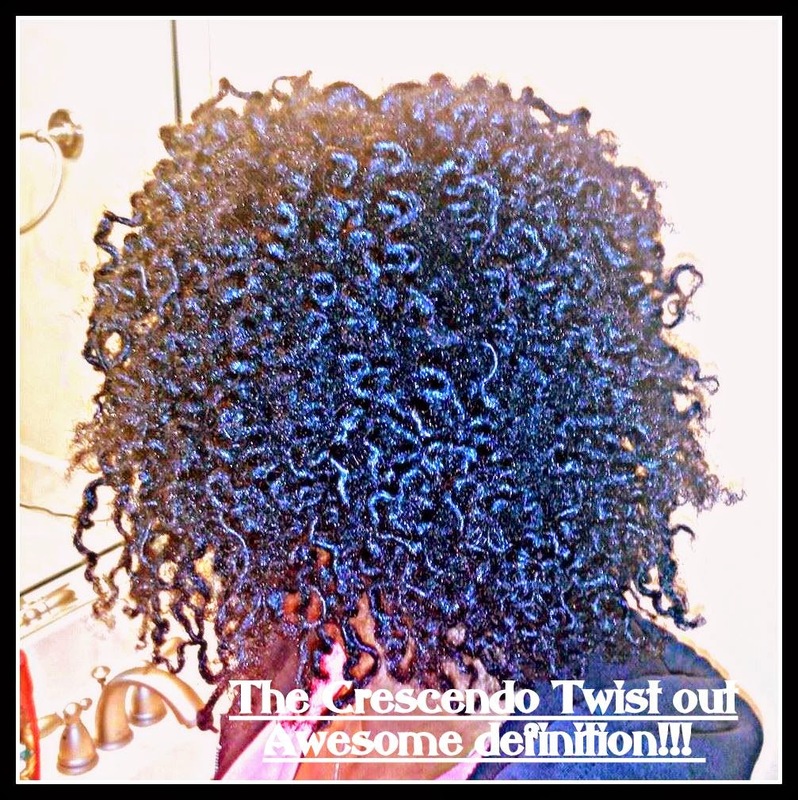 CHECK OUT THESE LOVELY COILY QUEENS WHO ARE PERFECTING THEIR TWIST OUT USING THE CRESCENDO TWIST OUT METHOD. 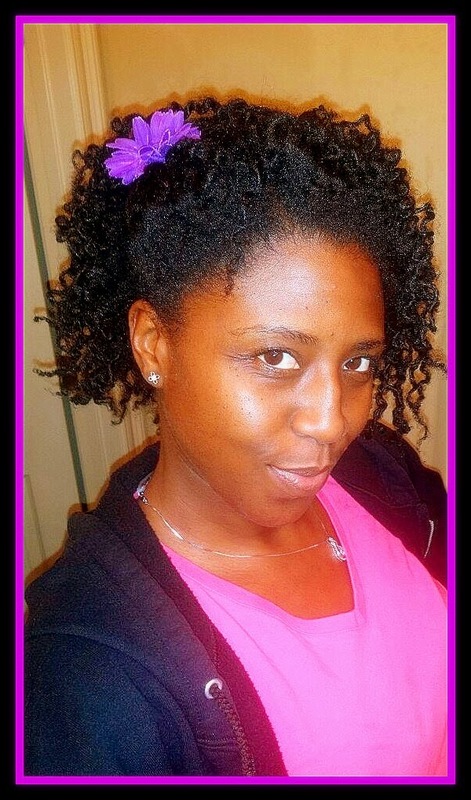 Meet Andrewnette McElroy she is perfecting her twist out by trying the Crescendo Twist Method. She has a hard achieving good definition in her twist outs. Her twist out for day 3. Look at her awesome definition! 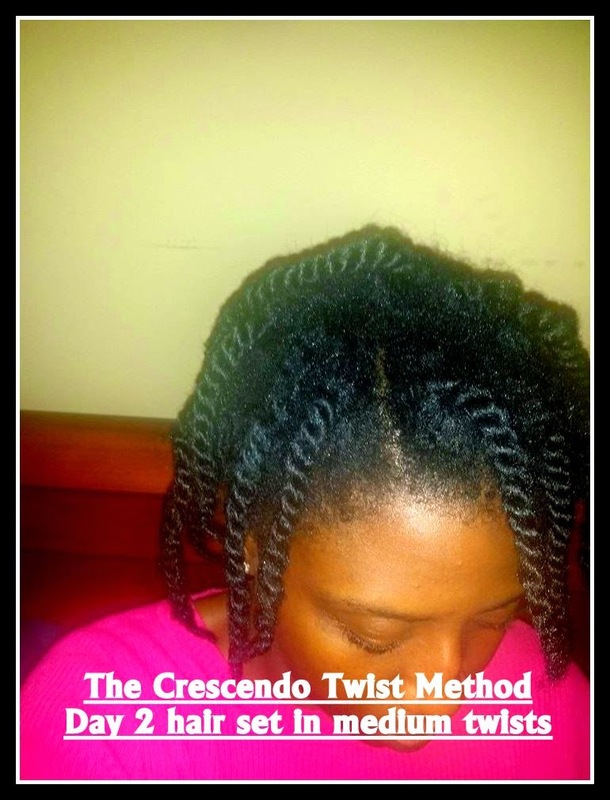 Before trying the Crescendo Twist Method she had a hard time getting twist definition. Front view of her awesome twist out!!! Day 4 of the Crescendo twist out method. The hair retains definition from your day one small twists set. Back view of day 4. Your twist out will continue to have definition until your next shampoo. After day 4, you set your hair in large twists, if your hair is medium density or lower. If your hair is thick then set your hair in medium twists every night, until shampoo day. Ms. Vee, I am thanking God for you! I did the BC in Aug 2013. I am glad I did, however my hair has grown fast and I did not know what to do with it for maintenance or styling. I am 66 years old and over 50% gray. 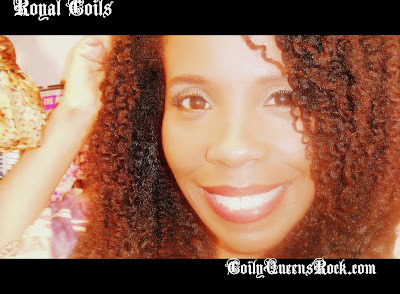 I was paying someone to do coils but did not like the spirit of the place (ugh) and all the pulling with a comb. Before finding you I had spent many hours reading Youtube tutorials. I thought I was learning good information and some of it was until I learned I had 4c hair! Then I was blessed to find you just one day after purchasing and using all the stuff I learned about. I had to go out and repurchase what you recommended. WOW your products and expert advice has made the expense of repurchasing products worth it!!. I washed my hair again today (that is two days in a row as I had to get a certain gel out) as it was crunchier than potato chips. I did the DC and ACV and the curl enhancer smoothie and I am thrilled and again grateful to you! I love my gray hair and hope the vinegar will keep it clean and bright. There does not appear to be much information on gray hair maintence. Keep up the great work. I love your blog.